Welcome to more diamonds. While I love the stitch, this post is really a story of threads. Take a close look at the stitched sample. It is an interesting exercise in thread weights and distinct finishes. 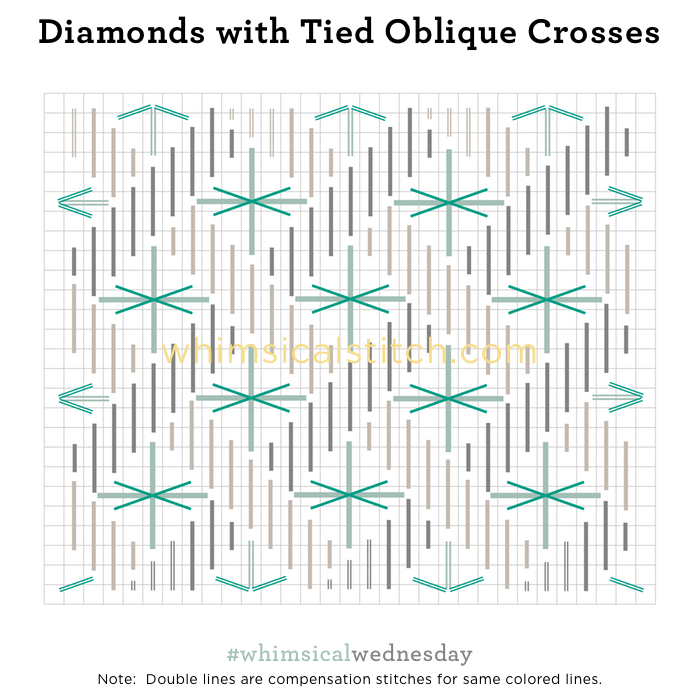 The parallelograms surrounding the 6X6 diamonds are two different grays on the diagram and two different matte threads on the stitched sample. The dark gray lines represent DMC Perle Cotton and the light gray line represents Vineyard Silk. The diamond is filled with two different metallic threads. The aqua lines are Shimmer Ribbon and the teal lines are Kreinik Metallics Tapestry Braid (#12). This is not the only way to stitch this stitch. Feel free to stitch the parallelograms in a single thread. Depending on which part of the stitch (the parallelograms or the diamonds) you want to pop, adjust the thread weights accordingly. Consider metallic parallelograms with velvet diamonds. Try two different colors of a matte thread for the parallelograms with one color (but two threads) for the diamonds. There are so many things you can do with this stitch. It's great for any number of large areas...large fruit (as illustrated in the stitched sample), clothing, baskets, roofs, or floors, just as thought-starters. Our last open stitch for the month is from a single subject canvas. I mention this because the space this stitch covered was huge. It is so huge, in fact, today's diagram is a smaller scale than the actual stitch. The piece is a retired Melissa Shirley canvas with a single apple. (As a side note, this is the canvas that started me down my path of fruit canvas obsession.) Truth in advertising dictates I share Wendy Harwood of Aristeia helped me craft this stitch for the apple. It was the perfect stitch to show off the shading. Honestly, I recommend adding the dark gray lines first. Tie them down (dark aqua lines) at the intersection. Add the light aqua lines last. You will see the stitched sample is on an even larger scale. The diagram illustrates the center element (light aqua lines) as over 2-2-2-6-6-6-2-2-2 rows. 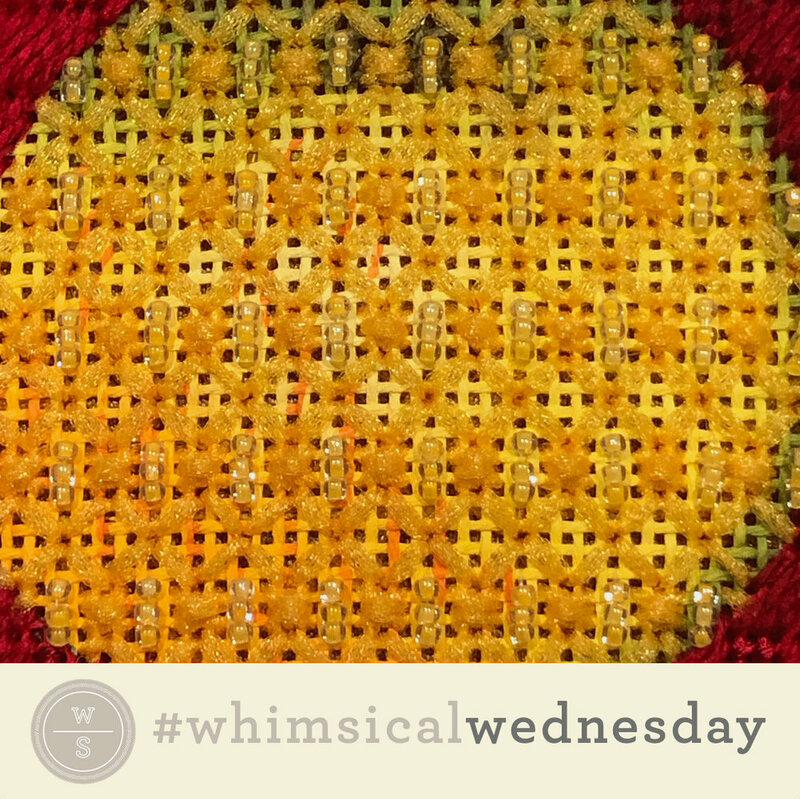 The center element on the stitched sample is over 4-4-4-8-8-8-4-4-4 rows with the diamond grid moved accordingly. It still grazes the far right and far left stitches at the same points, regardless of the size of the center element. The gray lines are DMC Pearl #5. Both aqua lines (light and dark) are Kreinik Metallics Tapestry Braid (#12). A little background. When I returned to the world of needlepoint, I was #teamfullcoverage for several years. I could not get my head around what I called "naked canvas." Oh, how wrong I was. Without a doubt, it took some coaxing and hand-holding. Here I am, twenty-some years later, I can't imagine a single piece of needlepoint I've stitched, or am stitching, without the dreaded...I mean gorgeous...naked canvas. It's about balance, focus areas, and symmetry. I begin with the Pomegranate Stitch. I have no other name for it. This is because the stitch is comprised of several small stitches that create a gorgeous pattern and I used it on a pomegranate. Makes sense, right? The first diagram is the first group of stitches that would be fine just as they are, especially with a piece with gorgeous shading. But, no. I needed more stitches, so I added an Upright Cross (the light gray lines) inside the small diamonds. Was that the end? Of course not. More oblique layered crosses were added. And some tiny Mosaic stitches. The stitched sample on Instagram reflects the final diagram. I included all three steps because I wanted to make a point. Any of these three combinations work as a group of stitches. Truth be told, if I re-stitched this piece today, I would stitch it with the middle diagram so I could have more naked canvas. It's all a matter of taste and your desired coverage level. What is universal, regardless of which diagram you prefer, is the threads. When doing open work, it's important to integrate thread weight into the equation. Generally speaking, I choose lighter weight threads as a secondary way to let the shading show through. Case in point, I used size 5 pearl cotton and size 12 Kreinik Metallics Tapestry Braid on 13-mesh for the pomegranate. I would even use size 8 pearl cotton and size 8 Kreinik Metallics on 13-mesh to make a point. It works, I promise. And, as with all things needlepoint, it is all a matter of taste. So, experiment to find what works for you. Meaning, yes, today's stitch combines Beetles and Tramme. We knew it had to happen sometime. The stitched sample on Instagram is a retired Melissa Shirley fruit canvas. I love me some fruit needlepoint. You'll be seeing more of my fruit stitches in February, as they are great examples of open work (February's theme). The stitched sample uses Elegance (gray lines), Flair (aqua lines), and Kreinik Metallics Fine Braid #8 (turquoise lines) on 13-mesh. As you may know by now, I like a lighter touch, especially on background stitches. Flair was a strategic choice. I love the way that Flair lays flat. It is a great base thread for Tramme.